Their sound is raw and melodic at the same time, with a very underground (almost demo) production. The guitars have a “dirty” distorted sound that adds a frozen feeling to the music. There are also many keyboards, other times more dominant creating almost symphonic black metal songs and other times just in the background. There is an epic pagan atmosphere in the album with some more melancholic nostalgic songs. All of the nine tracks have very long titles, dealing with nature, life and wolves! The vocals are expressive black metal screams, in perfect balance with their overall sound. Someone can listen also to some acoustic instruments and a folk mood, but most of the time it’s pagan melancholic black metal. 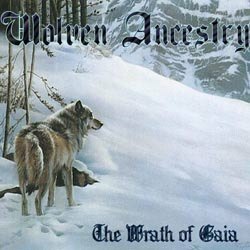 Wolven Ancestry actually don’t offer us something new, but they are very good at what they do, and this debut is definitely better than many releases in the genre. For those who care, they are also supporters of wildlife and their official page links to http://www.wolfeducation.org. They are now preparing their upcoming second album and in their myspace or Facebook official pages you can listen to songs from “The Wrath of Gaia” and some pre-production tracks from their next, yet untitled album.